References in other publications are fleeting and part of larger discussions of Wikipedia, not progressing beyond a definition, although David Brooks in The Nashua Telegraph described it as wild and woolly. [m] One of the impediments to independent coverage of Wiktionary is the continuing confusion that it is merely an extension of Wikipedia. [n] In 2005, PC Magazine rated Wiktionary as one of the Internet's "Top 101 Web Sites", although little information was given about the site. ^ "Wiktionary.org Site Info". Alexa Internet. Retrieved 2015-08-01. ^ Krizhanovsky 2012, p. 14. Krizhanovsky, Andrew (2012). 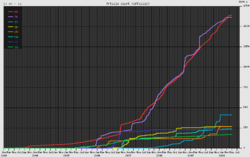 "A quantitative analysis of the English lexicon in Wiktionaries and WordNet" (PDF). International Journal of Intelligent Information Technologies (IJIIT). 8 (4): 13–22. doi:10.4018/jiit.2012100102. Retrieved May 9, 2013. Lin, Feiyu; Krizhanovsky, Andrew (2011). "Multilingual ontology matching based on Wiktionary data accessible via SPARQL endpoint". Proc. of the 13th Russian Conference on Digital Libraries RCDL'2011. Voronezh, Russia. pp. 19–26. Meyer, C. M.; Gurevych, I. (2012). "OntoWiktionary – Constructing an Ontology from the Collaborative Online Dictionary Wiktionary" (PDF). In Pazienza, M. T.; Stellato, A. Semi-Automatic Ontology Development: Processes and Resources. IGI Global. pp. 131–161. ISBN 978-1-4666-0188-8. This page was last edited 22:50, 17 October 2015 by Wikipedia user JustBerry. Based on work by Wikipedia anonymous user imported>Kslays.